Dear Mum, just got your letter in which you mention your many history-making exploits. I hope while you’re concentrating on making history that you’re also concentrating on getting well. I don’t know if you will still be in there when you get this ˗ I’ll send it to the hospital anyway, and put a wee note on it where to send it if you’ve gone home by this time. Glad to hear however that as usual you’re enjoying yourself thoroughly, though I do think it’s about time they found someone else to pick on for their experiments ˗ they always seem to find you such an interesting case, don’t they? Wonder why you’ve been given so many little peculiarities? Glad to see also that everyone is looking after you so well; funny, isn’t it, how both you and I seem to be considered quite helpless and everyone seems to rush to help. I often have dear old ladies helping me to buy things in shops, and others seem to find a good old sounding board in me for all their troubles. I know more about complete strangers’ troubles than anybody else’s! It’s nice also that you’re in hospital in the Spring; you’ll be able to see all the trees and flowers coming out into bloom from your own private window. We’ve had our first touch of Winter today; I was staying overnight at Mike’s (it was his birthday yesterday, and he invited me around for a meal ˗ and very nice it was too, and we just spent a very quiet evening sounding like two under-under-graduates according to Lindsay!) and when I went last night it was quite pleasant and mild, and I only had a jacket on over my shirt. This morning however there was a distinct chill in the air ˗ even though the sun is still shining quite pleasantly, and it looks very pleasant as long as you’re indoors, but I was feeling a little like a slightly refrigerated person by the time I got home. I don’t think I told you any more about Edinburgh, did it? (I’ve written to Hazel who is away at the moment, and I think it was her that I told the rest of the story to.) Anyway on Wednesday morning when we were supposed to work solidly for about three and a half hours we arrived and rehearsed (after about half an hour’s wait) with the cameras, and then went and sat about and then were made up and then sat about, and then filmed it quite casually in about ten minutes! And it was apparently so right (a piece of commentary had to be fitted over the last part of our performance and it was so well timed that it ended exactly as we did!) that we didn’t even have to do it again, which they’d expected to. I think they felt they wouldn’t get it right again if they did do it. So we finished quite early in the day, and after we had a huge salad each in a place that Ande Anderson (the producer) knows, we went our separate ways, and I wandered off to see some more of the place that I hadn’t yet taken in. 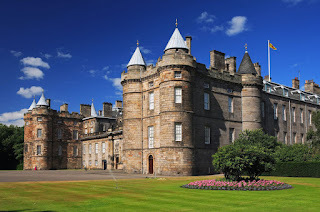 I wandered around the East end of the town, I think, and this brought me to Holyrood House [Palace] eventually, which I investigated. Unfortunately they didn’t really show very much of it to us ˗ only about one floor, out of three or four, and not all of that I suspect. Still it was interesting, though like many other things it no longer exists as it did when it was first built, and only parts of rooms are as old as the entire establishment. A ceiling here, a or a door here, or a staircase here. Still the room where Mary Queen of Scots was having dinner with a couple of friends the night her secretary Rizzio was murdered about two rooms away is there, and the spot where he was left dying ˗ though the little private dining room (about as big as our kitchen!) has a telephone in it these days! And the bed her husband slept in is still sitting in his room, made up, as though he were just away in England for the day. There are lots of fascinating little curiosities, and even more that we couldn’t see, I think ˗ you seem to have to go around with one of the guides who only shows you what they think is necessary. Though they are fairly knowledgeable about the place, and conversation with them is rather more fascinating than actually listening to the talk, which leaves dozens of little details out. The setting for the House (like that of the Castle, which had about the magnificent setting possible on top of a sheer rock) is fabulous. It’s at the other end of the Royal Mile ˗ walk straight up the road and you eventually come to the Castle gates ˗ and is sort of the end of the world; all at the back of it is a great roll of hills, with a huge scar down the side of the closest. I first saw the House from above, in the sort of park area (Calton Hill ˗ correct spelling incidentally) which is full of overpowering monuments to long forgotten leaders of the town, and up there you can really see the setting. Everything is heavily built in Edinburgh; one imagines it would take an atom bomb just to shake the foundations let alone knock it down. Since I got back I’ve had to work all the four remaining days of the week; Thursday through to Sunday, morning noon and night. I was nearly up the wall at the end of it. Fortunately I’ve had two full days off to compensate. Still, as employers they’re fairly good, in that I only seem to need to ask for a certain time off and they say, Oh, I think that can be arranged! Lots of love and keep progressing!